Free Menstrual Calendar tracks your periods and predicts when you will get your period based on your past data and usual cycle length. You'll be able to plan holidays and events, be prepared with supplies and know if any symptoms you may be experiencing are related to your menstrual cycle. Your menstrual cycle and menstruation information is also an important indicator of your health and wellness. Tracking your periods, your menstrual flow, menstrual cycle length and symptoms (such as headaches, bloating and irritability) that may fluctuate in relation to your menstrual cycle can give you a window into a variety of health concerns. Free Menstrual Calendar can help you and your healthcare provider to see if your cycles indicate anything of concern. * Discreet pinwheel icon says "FMC"
* Display your cycles at a glance on an easy to read calendar. 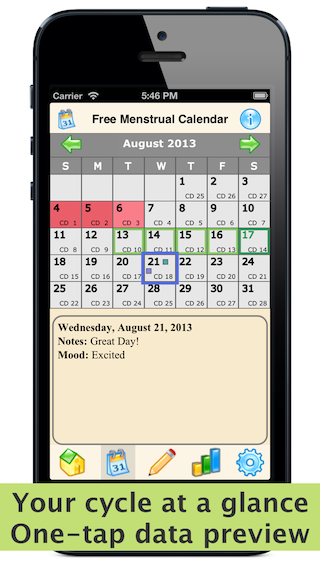 Color coded calendar is easy to read and personal data display is discreet. 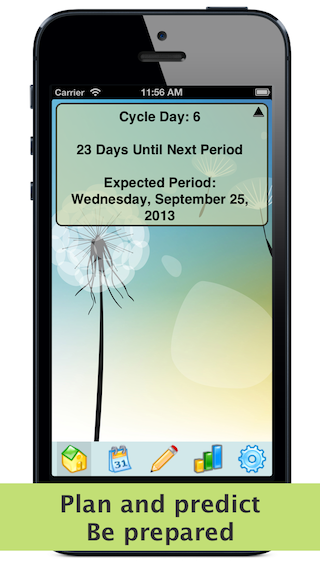 Getting Prenant: Will Free Menstrual Calendar Period Tracker help me plan a pregnancy and get pregnant? Avoiding Pregnancy: Can I use Free Menstrual Calendar to avoid pregnancy? First Day Of Cycle: What counts as the first day of my period? Spotting: Is it normal to spot between periods? On the Pill: Can I use Free Menstrual Calendar if I'm on the pill? Menstrual Cycle Factors: What factors can influence my menstrual cycle? Pregnant During Period: Can I get pregnant during my period? Most Fertile Days: How can I tell when I'm most fertile? Irregular Cycles: What is a normal menstrual cycle length? Should I be concerned if my menstrual cycle is irregular? Normal Periods: How heavy should my period be? How long should it last? PMS: What is PMS? How common is PMS? How do I know if I'm experiencing PMS?